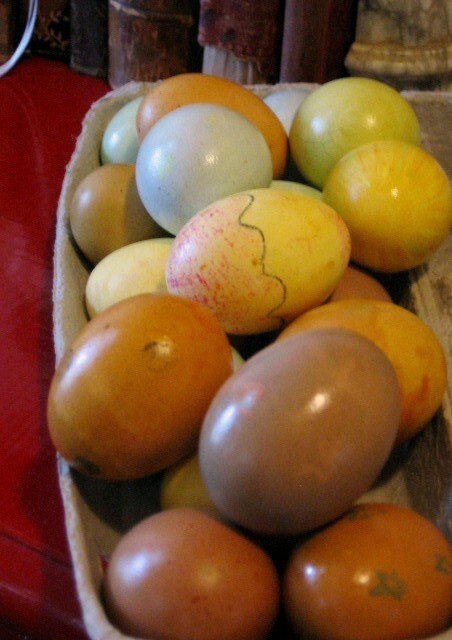 This year’s batch of Easter eggs had a startling new look: they were bright crimson—and already peeled. That’s right, beet pickled eggs. 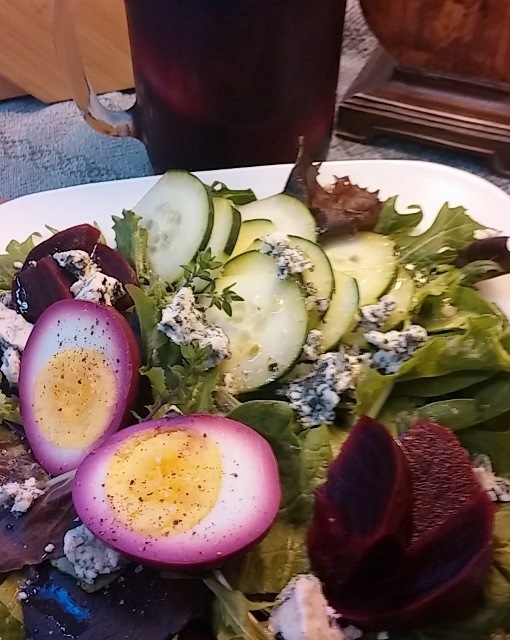 I had already set aside a good supply of eggs, when fresh beets caught my eye at the market recently. It was the ideal opportunity to start up a new jar of pickled eggs. I suspect many would say just boil everything up and be done with it. Unfortunately, I prefer roasted instead of boiled beets. Roasting helps retain their color, flavor, sugar, and moisture. I also like ‘al dente’ beets: roasting just until they begin to soften but still have a slight amount of resistance. They hold up better and do not become soft and mushy. Actually, roasting beets is far simpler than boiling because the bleeding beet issue is neutralized. The skin pulls of quite easily, thus minimizing the threat of stain. The pickling solution is pretty straight forward, too. In spite of the beets’ natural sweetness, I add a small amount of sugar to the pickling solution to smooth out any inherent vinegar bite for both the beets and the eggs. Incredibly, the eggs are ready to eat within 24 hours, as are the beets, and they will continue to take on color and flavor the longer they soak. More good news: the pickling solution can be reused. 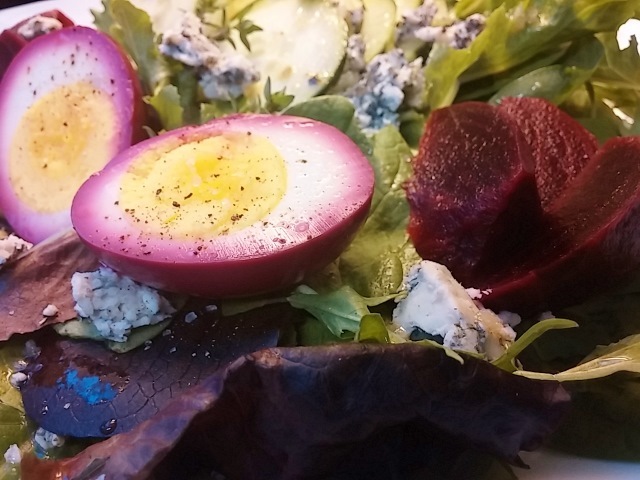 For a new batch of eggs, remove any lingering beets for salad or other purposes. Boil the liquid for about 5 minutes, cool it, and add a new batch of hard cooked eggs (beet-less but still beautiful). Prepare the pickling liquid: in a small pot heat the vinegar, sugar, the seasonings and garlic and bring to a boil; simmer for 3 – 5 minutes. Remove from heat and add 1 cup water to dilute. Allow to cool. To roast the beets: preheat oven to 375° F. Rub the uncut beets with olive oil, sprinkle lightly with water, and wrap it in aluminum foil to seal. Roast 50-60 minutes, depending on size of beet. They are tender when a knife can be inserted toward center is no longer hard, but still has slight amount of resistance. Let cool. Using plastic gloves, remove the skin by gently rubbing it off; peel if needed. Cut chunks or slices and place in the jar. Pour the pickling solution over the beets in the jar and let cool. This can be done ahead and stored in the refrigerator until needed. 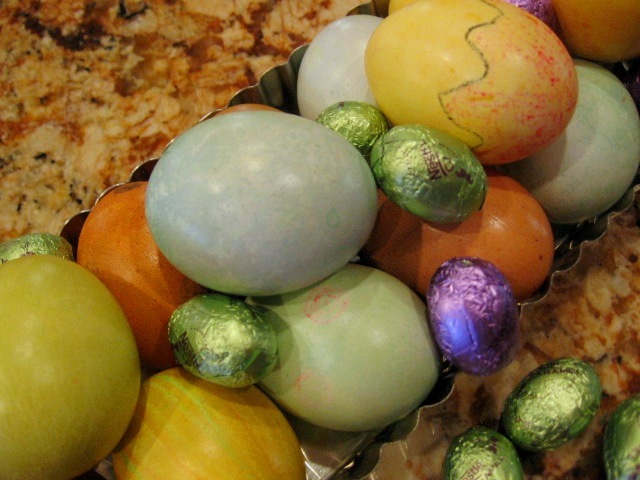 To hard cook the eggs: place 6 eggs in a saucepan and cover them with at least an inch of cold water. Bring the water to a boil over medium-high heat; cover, remove from heat and let stand undisturbed for 10 minutes. Drain the eggs and place them in ice water to cool. To remove shells, gently roll eggs all over to loosen the shell, and peel. Add eggs to pickle: Add cooled or chilled eggs to the beet pickle and shake or stir to evenly distribute. Store well-covered in the refrigerator for at least a day before sampling. They will pick up color and flavor the longer they sit and will last a month or longer in the refrigerator. Yield: 6 eggs. 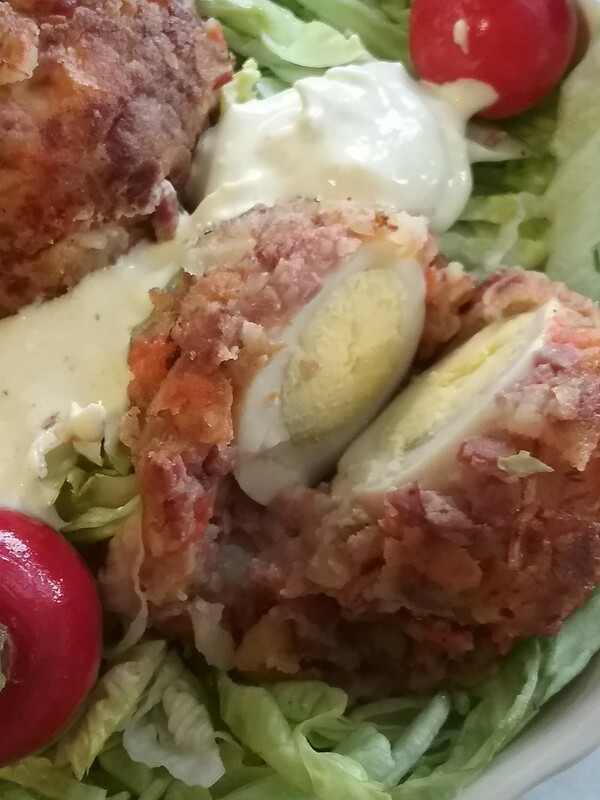 This year it seems I’ve had my share of conversations about the best way to hard cook eggs, of which I have previously offered one or two ideas here. Still, I can’t help myself; I keep tweaking the process. There is something highly rewarding and downright sensual about a perfectly prepared hard cooked egg. 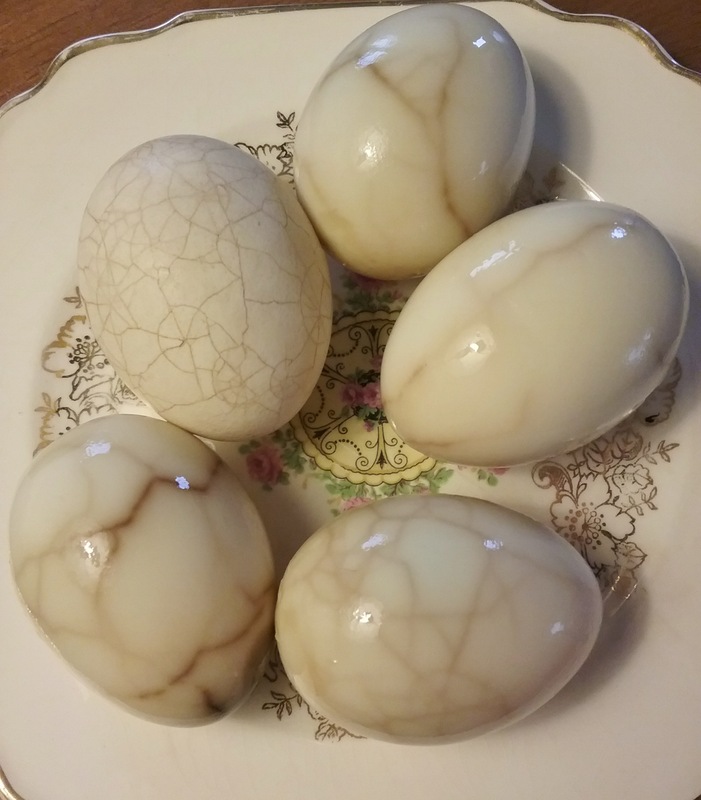 It is not rubbery when you bite into it; it is moist yet supple, with a delightful contrast between the white and the yolk; the yolk is deep in color, firm, yet creamy. It is the perfect package. 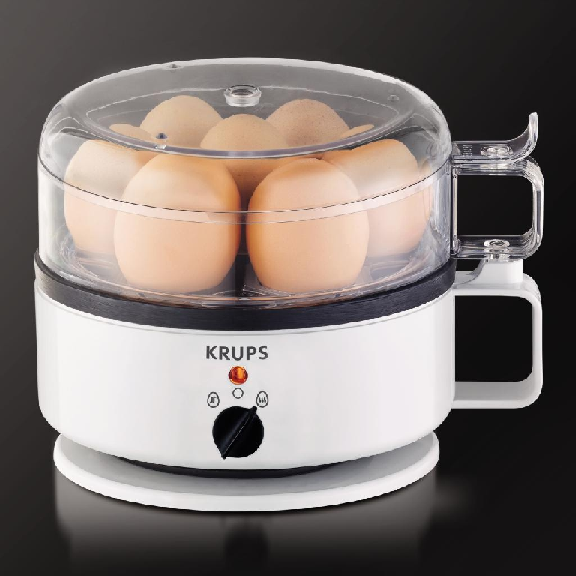 So, I wasn’t terribly surprised to find a Krups Egg Cooker under the Christmas tree this year (could it be a gift with a message?). My reaction: just what I need, another gadget. Turns out, this little guy is designed to cook eggs to your preference: soft, medium, or hard cooked. It even poaches and steams tiny omelettes, too. Actually, it’s kind of cute. 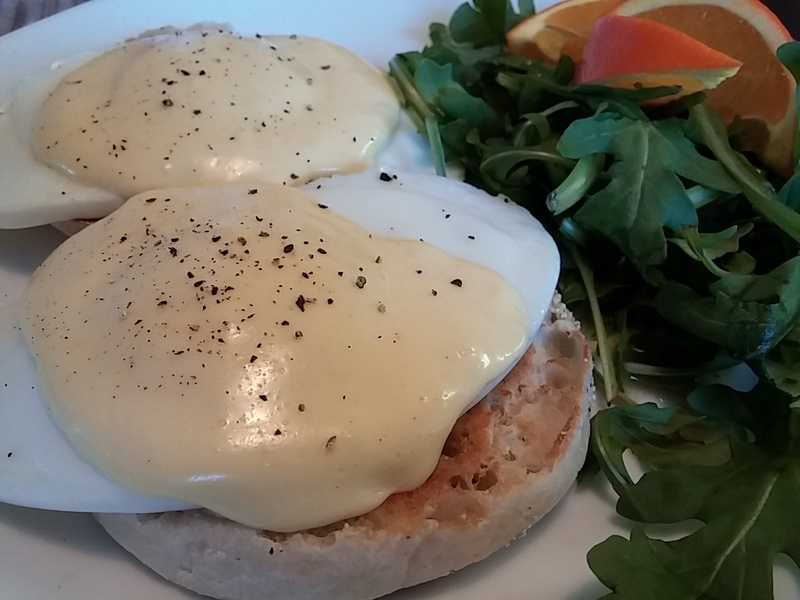 Since I have also been planning to tweak my Hollandaise Sauce, it seemed like the perfect opportunity for a double egg whammy: fire up the egg cooker, give the egg poacher a spin, and make modified Eggs Benedict, without the ham. Yes, there was some egg juggling going on, but in the end, it was a success. About the Hollandaise Sauce: these days, not having my blender nearby necessitates a slightly different approach to my old blender Hollandaise. The revised recipe is designed for an immersion blender, but should work just as well with a traditional blender. This sauce also has better holding power than the average Hollandaise. The addition of cornstarch stabilizes the sauce, which allows it to be held without fear of breaking, plus it can be re-warmed prior to service. Just remember not to overheat the sauce. Quick sauce using immersion blender and microwave. Heat butter in microwave until it is melted but not bubbling; about 40 seconds to 1 minute at power 6 or 7. In a small bowl or 2 cup measuring cup, place the 2 yolks through cornstarch and whisk with fork to combine well. With emersion blender running, slowly pour the warm butter into egg mixture. It should become creamy within 1 minute. Place sauce in microwave and heat 20-30 seconds at power 6 or 7. Beat briefly with blender for thick and silky sauce. Repeat if necessary. Note: microwave settings may vary depending on model. The sauce an be made an hour or more ahead and held at room temperature. 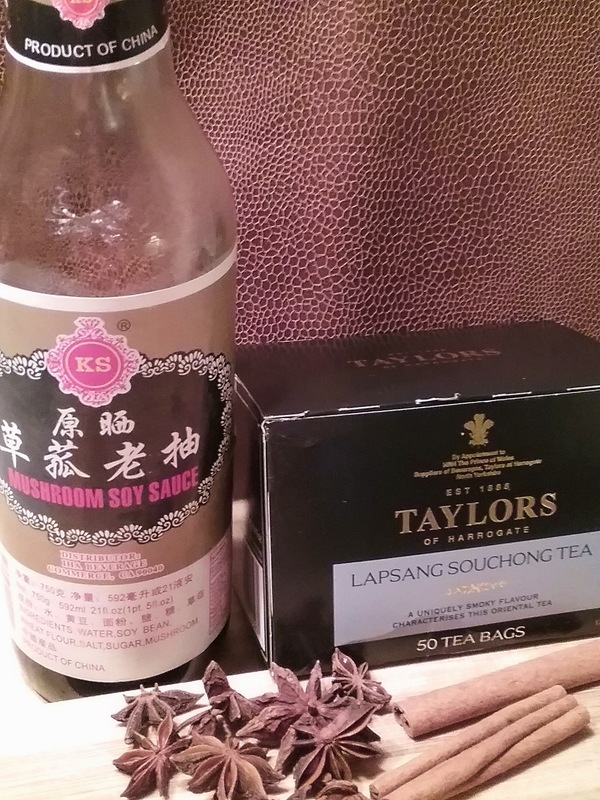 Before serving, add 1-2 Tbsp hot water and blend again. Yield: 1 cup, approximately. For Easter this year I tried my hand at coloring eggs with natural food elements found around the kitchen—instead of using packaged egg dyes. My great experiment yielded delicate colors—far softer and more realistic than the deeper jewel tones from off-the-shelf dyes. Still, with only basic items on hand I was able to create a nice palate of colors. I learned that chopped red cabbage tends to go into shades of blue; my red beets unfortunately turned out to have predominately white interiors, but their stems were enough to provide a pale pink. I had no saffron, but turmeric yielded lovely shades of yellow (I understand yellow onion skins will also do the trick). Even though I used over 10 cups of chopped spinach, it only resulted in a sad, insipid pea green. Working with a small one quart pan, I started with about a tablespoon of white vinegar, 3 healthy handfuls of the chopped vegetable, covered it with about 3 cups of water and let it simmer for 10 to 15 minutes—until the water turned a deep vibrant color. Including the eggs in part of this cooking process is a viable option; it will result in more mottled coloration as some of the food/material may adhere to the shell while it simmers. Since my eggs were already cooked, I opted to strain the finished dye solutions and dip the eggs into individual glasses of colored liquid. In this manner, I could dip the eggs into different colors for varying results or combine the colors to create new shades. I love playing with my food. I love the challenge, the discovery, and the delight that comes when I approach the taste, the appearance, even the way I use my food, from a completely different perspective. Yes, even the most rudimentary foods can be dynamic. My little Easter egg project was not only entertaining, it was gratifying to revisit an honored tradition—to be reminded that there is joy in keeping it simple. Here’s a fool-proof way to achieve the hard-cooked stage: where the white is firm and the yolk is set, without any ugly green rim. Gentle cooking is best. Boiling and excessively bouncing an egg over very high heat for an extended period results in a tough white with a dry yolk. Place desired number of room temperature eggs in a saucepan and cover them with at least an inch of room temperature water. Quickly bring to a boil; immediately reduce heat to low and simmer the eggs gently for 5 minutes. Remove the pan from the heat and let the eggs stand covered for 10 minutes. Drain the eggs and place them in an ice water bath until cool. To peel, gently crack the eggs all over on a hard surface, then peel them under cool running water.